It has recently come to my attention that I have too much tea. Personally, I didn't think this was possible. But L assures me that I have, in fact, crossed the too much tea threshold. This is why I only brought home 1 tin of tea — the Fortnum and Mason Royal Blend tin you see here. 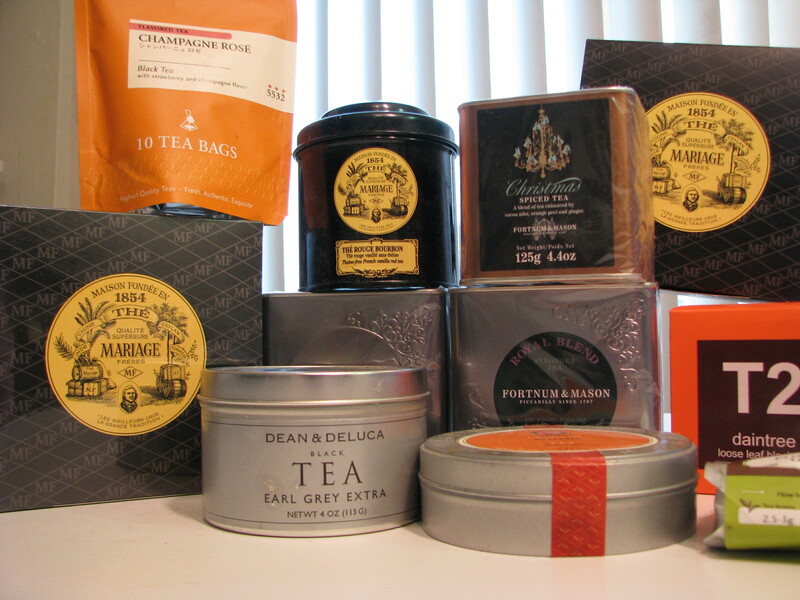 Of course as luck would have it, I already had an unopened tin of that tea, courtesy of L's mom's last trip to London. Oopsie. I have a hanging fruit basket in the kitchen, crammed full of tea. And a few tins hiding on the back of the stove. And a couple in the pantry. It's been worse than this, mind you. So I suppose I could concede that I do have enough tea to last me for a good while. It's a cold and rainy Sunday, that came in on the heels on a cold and rainy Saturday. So my pot of Dean and Deluca Earl Gray Extra is keeping me cheery and warm as I continue through organizing my many clipped recipes into a nice spiral bound book. I can't imagine limiting myself to just one or two tins of tea. Because day-to-day, what I am craving to sip in a hot mug changes. Some afternoons I want the Mariage Frères Bouddha Bleu green tea. Other days, it's the Mélange Hediard that grabs my attention. I make a point of bringing home tea whenever I travel. Thus sipping a cup of it once I return home brings back memories of my travels. Overall, it's a minor vice to have as far as vices go. Note: To the horror of tea enthusiast purists, I prefer to grab bagged tea for drinking at work, to avoid the hassles of dealing with tea strainers (and inevitable tea stains) on my desk. With traditional tea purveyors like Mariage Frères making new strides in creating tea bags that don't leave your tea tasting papery, I think that prejudice should slowly shift over time. At home, I use a basket insert for my tea pot, or individual spoon strainers with a hinge. Store your loose tea in airtight containers. I try to buy it in tins whenever possible. If you bought your tea leaves in a plastic bag, transfer it to a glass jar with an airtight lid, or to a clean, previously used tea tin. If you buy teabags, make an effort to use them within 6 months of purchase. Don't open all your tins at once. I allow myself 3 open tins of tea at a time when I am drinking tea with any frequency. Try to find a cold dark (but not damp) place to store your tea. I live in San Francisco's Richmond District so that means pretty much any place in my apartment fits this bill for most of the year.